Hello Friends, Hope you are having a good day! As this post goes live I am in Seattle and you know that makes this Momma happy! 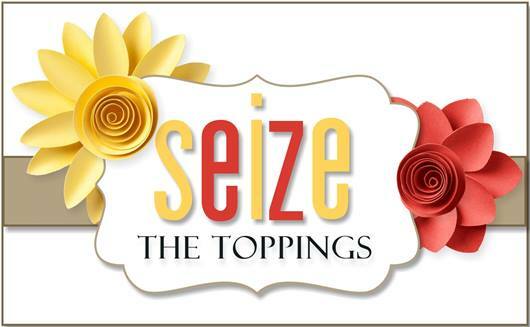 Anyhoo, It’s time for a new challenge over at Seize the Birthday! Our topping this time around is one I think you will really enjoy as it has a little bit of versatility. The topping if you decide to use it is Birds, Bees or Butterflies. As you can see in my photo I chose to use butterflies as I have a limited selection of birds and Zero bees in my stamp collections or even paper for that matter. Remember our toppings at STB are always optional and not a requirement, so feel free to just make just a Birthday card as well. Also, this card didn’t photograph as well as I had hoped and looks much more pleasing in person. The stamps are all from Stampin Up and that great Birthday sentiment, and banner was from some sticker packs I won at a local Scrapbook store. I covered up some of the banner flags with matching paper to make it match my card. Love the tailored look of this monochromatic card. Looks like we both picked butterflies. Have a great time in Seattle! I love the monochromatic look of this, Nancy. Have a great visit in Seattle. Beautiful card and have a great time in Seattle. Interesting color choice this week, but it is really lovely. 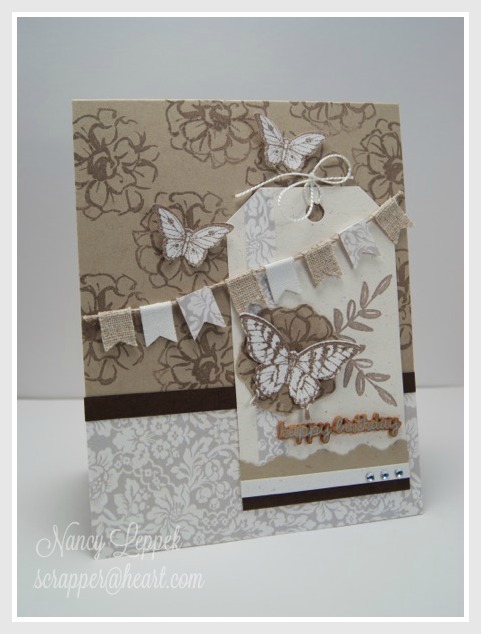 I love the neutrals and the fun tag, and of course, the sweet butterflies! Stay cool friend! I know that is hard in Florida!